Custom made Rose Gold and White Gold Scroll Band Ring. This beautiful custom made ring made by hand by Anita, a professional jeweler. 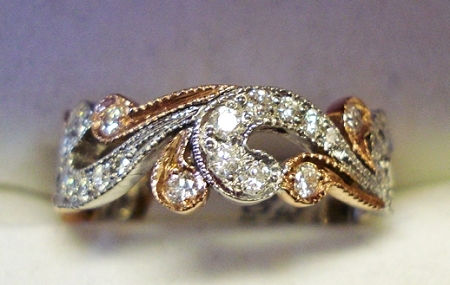 Ladies 14kt two- tone rose gold and white gold scroll cut out pave set diamond band 6.5mm wide, any size can be ordered, fourty four diamonds for a total weight of .76CT. Can be used as a wedding band or a stackable ring. Ring can be manufactured all white or yellow or two tone design.